At 1-0 down as the players took to the field for the second half, Cheltenham had much work to do in order to secure a play off spot. But then a minute later Kaid Mohamed crossed the ball, James Spencer beat Matt Duke to equalise, and the home side went on to seal a play off position-sealing 3-1 home win. That day – Saturday 28 April 2012 – was the last time that, in the league, Bradford City conceded an equalising goal. In all but five of the Bantams 19 league games to date this season, the opening goal of the contest has been scored by the team who went on to win the match. Two of those five were 0-0 draws (Rochdale and Chesterfield), another two were come-from-behind 1-1 ties (Accrington and York). Only during the next tussle with Cheltenham, did City concede the first goal and come back to win the match. But in every single match that City have opened the scoring, in the league, this season, we have gone on to win. It was for that reason more than any other that Gary Jones’ first half strike against Plymouth Argyle on Tuesday was a significant moment. Against truly limited opposition, it was a decisive lead that City rarely looked like losing. It was not an evening that will live long in the memory, but it was exactly the type of evening that builds the foundations of a promotion-winning team. For we can all reel off countless examples of how, in the past, City have failed to grind out three points from similar occasions. The 1-1 draw with Accrington last season has stuck in my mind for some time now. On the night we played quite well and edged in front through Nahki Wells. But we couldn’t see out a game that the visitors looked highly unlikely to come back into, with disappointing defending and one lapse in concentration from a corner costing us dear. It was precisely because of evenings like that that we remained unable to pull clear of relegation trouble. It is precisely because of so many games like that that we have remained stuck in League Two for five years. Many have criticised the performance on Tuesday and it’s undoubtedly true that we need to be better than that if promotion ambitions are to be realised. But when you consider the dropped points in the previous two home games against Chesterfield and Exeter, it was vital that we got back to winning ways at home. The style can come later, for now – and with the injury list mounting – we needed to see that substance. The delirium that beating Wigan in the cup provided – and fact we’ve earned a quarter final tie against Arsenal – has in some ways overshadowed the impact of those long-term injuries. Take away the cup heroics, and, before Tuesday, since Luke Oliver and Andrew Davies limped off injured before half time at Burton, we have scored just two goals in 315 minutes and won one out of three-and-a-half games (and both those goals and that win came against beleaguered Aldershot). It is, undoubtedly, a sticky patch for the Bantams. And at the moment the priority simply has to be to hang in there and get everyone fit and firing for the New Year. 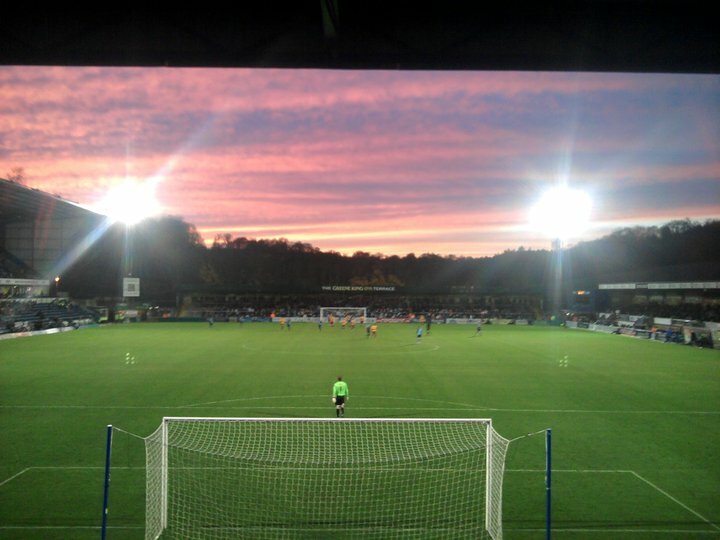 Promotion cannot be won on evenings like the one against Plymouth, but it can be easily be lost. If City can take a good number of points from this sticky patch, then the prospects for the rest of the season will look very encouraging indeed. So City travel to Bristol Rovers tomorrow looking to defeat another side who, like Plymouth, look rather demoralised at present. It’s just one win in seven for Mark McGhee’s outfit, with a dispiriting 4-0 defeat to Port Vale on Tuesday demanding a positive reaction. They are only one point above the bottom two and are – a familiar tale this – beset by a lengthy injury list. A defeat to the Bantams tomorrow could well see them slump to the bottom of the Football League. For City, the days after the Plymouth win have been occupied with the challenge of replacing the replacement for Davies and Oliver. John Egan’s leg break was a horrible moment which, in truth, completely overshadowed the 1-0 victory. Having impressed since he joined on loan at the start of this month, there was talk that Egan’s loan spell might be extended until the end of the season. Goodness knows how City would have coped if James Meredith and Stephen Darby had not returned from minor injuries on Tuesday. If we have to endure more injuries – and let us hope we have now filled our ratio and then some – please let it not be to another defender. Curtis Good has arrived on loan to replace Egan but will probably start from the bench, as Phil Parkinson looks set to reward Carl McHugh for his impressive display on Tuesday with a starting berth alongside Rory McArdle. In midweek Darby and Meredith successfully demonstrated their attacking qualities that were missing from the full backs against Exeter on Saturday, and will line up either side of the central defenders. Matt Duke – impressive Tuesday – keeps goal, though Jon McLaughlin continues to breathe down his neck. In midfield Gary Jones and Nathan Doyle perhaps best personify the Bantams’ sticky patch. Neither have been at their best of late, but continue to toil for the team and deliver positive contributions. Will Atkinson had another solid game midweek and is, at present, one of the first names on the team sheet. The opposite flank is more difficult to decide, with neither Craig Forsyth nor Garry Thompson making a case for a starting berth. Perhaps Ritchie Jones will get the chance to build on an impressive cameo midweek, with Zavon Hines and Kyel Reid around three weeks away from returns. Blair Turgott will likely start from the bench. Up front, the lack of recent goals is a concern. It’s stating the obvious that James Hanson needs a goal. I still think that his overall play is good and he produced some excellent flick ons midweek, but we know that he is capable of better and it’s to be hoped he rediscovers his top form. Wells has been subdued by his standards in the last three home league games, but has scored in all three of his last three away games. Alan Connell is pushing for a starting place too, but is proving to be a good impact sub. When City beat Aldershot in their last away game, two weeks ago, we all eyed up a fixture list of Exeter, Plymouth and Bristol Rovers as a chance to close the four point gap on third place Cheltenham and get into the automatic promotion spots. Pre-Northampton cup replay I wrote that “The last thing we want to see is a home defeat to Exeter on Saturday that is partly attributable to tired legs,” only for that scenario to happen. But with Cheltenham stuttering, we have in fact cut the gap to one point and could easily jump into the top three with another win. You can’t see tomorrow being pretty. It probably won’t be memorable. But another win would be a great way to take a break from the league for a fortnight and go back to the no-pressure cups. A win would be a great way to round off this sticky patch. And if we get the first goal, be confident that will happen.